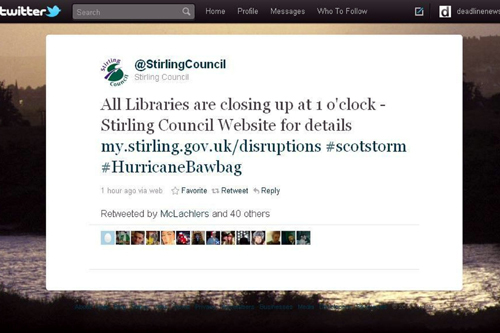 Stirling Council: #hurricanebawbag – would your council have had the balls to use this hashtag? For many, the 8th December was a proud day to be Scottish. Despite the brutal hurricane-force winds battering the country, many Scots had a smile on their face as Scotland found itself at the centre of a media storm over its affectionate naming of the storm as “hurricane bawbag”. For those unfamiliar with colloquial Scots, the term bawbag means scrotum. 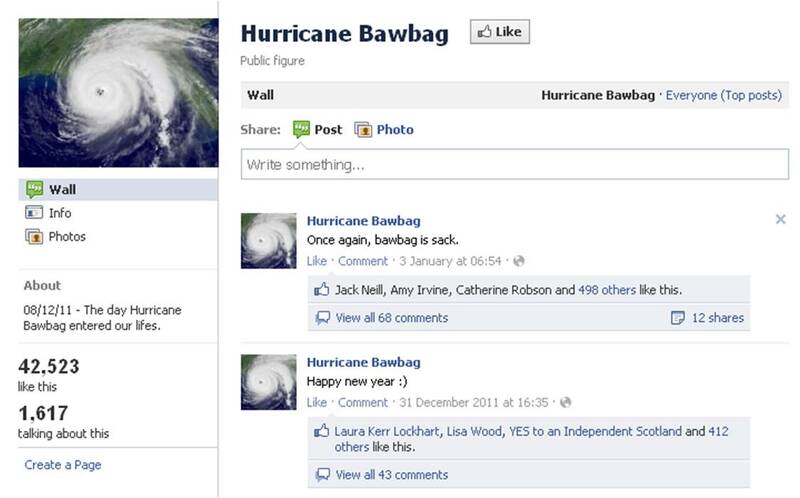 The mischievous epithet sparked a trending topic on Twitter, with #hurricanebawbag quickly becoming one of the top trending hashtags worldwide. 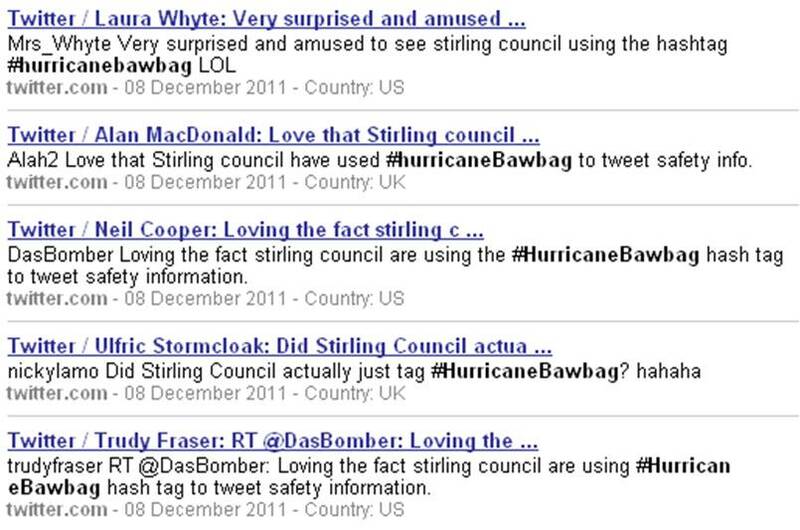 Just a couple of hours after the term was coined there was already Hurricane Bawbag merchandise on sale, and by 5pm, the hurricane had its own Twitter and Facebook pages. The worldwide adoption of the term – which utterly outstripped the official but comparatively dull name Hurricane Friedhelm and the hashtag #scotstorm – led to a dilemma for local authorities and the more upright members of the media community. What should they call it? Hurricane Bawbag was cheerily adopted by STV and the Daily Record, but the name did not appear on the BBC website, and the Herald and Scotsman ignored it. Sadly, it wasn’t long before the council thought better of its rather risqué tweet, and it mysteriously disappeared from its twitter stream. We can only speculate as to the internal council dialogue that led to its removal (“You said what?!! Do you know what it means?!! ), but it does raise an interesting question. Was the council right to use a highly popular (if somewhat improper) nickname, and thus broadcast important information to the widest possible audience? Or was it inappropriate? What do you think? What would you have done? 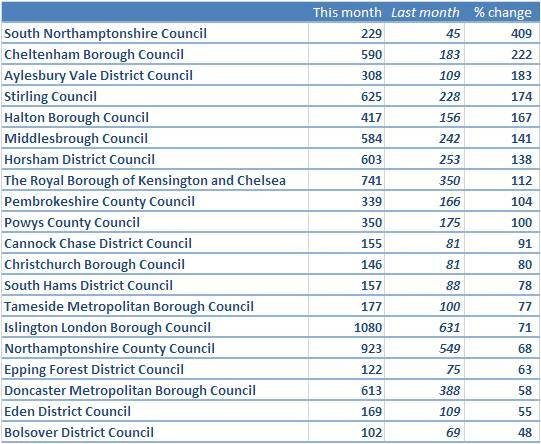 The council seeing the biggest rise in social media buzz this month was South Northamptonshire, following the approval of the Silverstone ‘masterplan’ for extensive development around the circuit. Jointly approved by Aylesbury Vale District Council (#3 in the top 20), the development will provide a mix of uses including offices, distribution facilities, three hotels, new spectator facilities, a museum of motorsport and an educational campus with accommodation. The majority of the social media interest came from the motorsport industry and associated blogs, with little activity seen on Twitter or Facebook. SNC themselves did not tweet about the news, despite issuing a press release the day after the plans were approved. This highlights the need for councils to integrate social media with their traditional communications function. SNC’s own Economic Development Strategy identifies the Silverstone site as of “vital strategic importance”; at a time of gloomy economic forecasts, this is a major ‘good news’ story for the region and deserves to be shared. In the run up to 2011’s New Year’s celebrations, trading standards teams for a number of councils issued warnings about the risks of conterfeit vodka. The story was widley picked up by the National Press, and included Horsham District Council’s warning over finding fake vodka that was found to contain industrial solvent Propan-2-ol. The story was reposted on the ‘Horsham UK’ Facebook wall, a very popular community. It is worth having a look to see how powerful Facebook can be when used well.